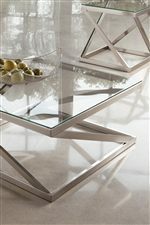 The Coylin accent table collection uses the clean look of brushed nickel color finished tubular metal bases that support beveled clear glass table tops to offer metro modern style. Sleek lines and angled legs offer an artistic accent for your living area that will inspire with the minimalist, contemporary design. Clear tempered glass tops with beveled and polished edge look finished while offering an easy to care for surface that is perfect for entertaining. Browse other items in the Coylin collection from Nashco Furniture - Nashville in the Nashville, Franklin, Brentwood, Clarksville, Green Hills, Davidson County, Williamson County, Tennessee area.